My molar, it hammered me. I groped for the clock and turned the yellow-green glow of its hands away. 3:15 am. Go and get some Orajel, or put an aspirin on it, but we had no hallways, only rooms. Dad would hear. The economy of prose, the poetic meter, the slightly awkward possessive pronoun, the brand-name reference, that terrific little break at the end—such joys are to be found on every page. The way Kelly wields (and welds together) words is astounding. It’s hard to decide if his style is retro or modern; the stories in Ambassador could only be stories—not podcasts or graphic novels or episodes of a web series. They are uniquely, transcendently literary. And yet Kelly’s observations seem, in their concision and cleverness, purpose-built for the social-media era—ingenious Twitter threads collected in print. The hole in a beat-up car is “the size of a medium pizza.” Scottish poetry sounds like a “busted mouth.” Characters don’t make coffee in coffee machines, they make “feeble joe in the automatic drip thing.” Clocks don’t tell time, VCRs do. These stories are ostensibly about “men and boys and maleness” (so the back cover proclaims in bold type), but what Kelly gives us is a different strain of rural masculinity: no beards or bikers or MMA here. His stories are populated by men, and boys, and—sure, yeah—maleness (whatever that is), but it’s the least interesting stuff. Or, more precisely, it doesn’t define the work, and certainly isn’t what makes the stories special. What does make them special is Kelly’s ability to take the sort of commonplace subject matter that would get you laughed out of a creative writing class—a father-son fishing trip, for example—and write it like it’s the only story that’s ever been written about fathers and sons fishing together. And he does this in a manner that doesn’t quite align with traditional notions of “maleness” (ie., tenderness, compassion, etc. ): a boy’s self-consciousness about how much his father has spent on a fishing rod, a lunch that’s “mostly leftovers,” a “knock on the door with just one knuckle,” how a boy “scooches” towards his dad. The writing’s elegiac thickness is both a source of the book’s greatness and an obstacle to conquer. The abundance of uncommon verbs and similes and staccato iambs can be overwhelming—it sometimes feels like an album full of songs that only have a chorus. Brilliant, but taxing. 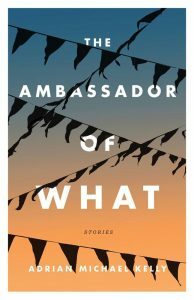 Ambassador might be a slim (and gorgeously designed) book, but it can’t be read quickly; the methodical prose requires methodical attention. This isn’t so much a criticism of the book, rather the programming of our brains in this age of abundance: we’re expected to swallow whole, like pythons, complete seasons of TV shows; we engage in online challenges to read the most books in the shortest timeframe. It’s easy to forget that great literature is supposed to be taxing; that it’s only worthwhile if it presents an obstacle to be conquered. I suppose what I really mean to say is: for the same reason you wouldn’t drink espresso from a pint glass, this is a book to be consumed in small portions: it’s too rich, there’s too much to miss if you don’t let it sit on your tongue for a while. The term “unique voice” has been rendered meaningless by so many dull cover blurbs—but, like much of the familiar stuff Kelly covers (and recovers) in his stories, his skill gives it substance. One figures all of this out in the course of reading. And when your brain finally clicks into Kelly’s rhythm, Ambassador accomplishes something rare: it feels fresh, a brand-new mode of storytelling; it rearticulates your way of seeing the world, reprograms your brain, gets your feet tapping to a different beat. And this is what makes it a book worth slowing down for. CNQ is looking for essays, meditations, reflections, stories, and poems on WRITING IN THE AGE OF UNRAVELLING. Full details are on our submissions page. We'll also keep you informed of local events, calls for submission, new issues, etc. We promise not to email too often, or to share your information with anybody! April 7, 2019 0 The Mystery-Anthology Mystery Solved? SUBSCRIBE TO CNQ's FREE MONTHLY NEWSLETTER!